Build Your Spaceship... and Recycle! Late last year my office moved to a new facility. Since we ever so wisely made the move while we were in the middle of multiple projects, and with the holidays distracting us during our copious "free time," there are still a huge amount of boxes waiting to be unpacked. This morning when I arrived for work, I noticed some progress was being made toward clearing away the debris. But what really caught my eye was a pile of trash that had recently appeared. 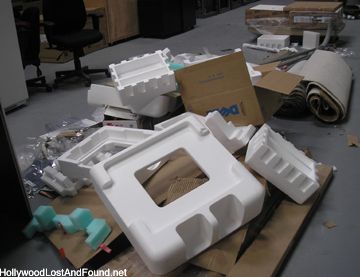 It was mostly made up of Styrofoam pieces that held our computers and other equipment tightly in their boxes. Sadly, these particular non-biodegradable products of the consumer age are headed for the dumpster, and eventually a landfill somewhere. Because of their near-indestructibility, about the only way to "recycle" them would be to do something creative - like turn them into some kind of art. When I saw them, I immediately began to imagine what I could do with these pieces if I were an art director on a science fiction film or TV show... and I actually started arranging a few of them on the floor. With a little paint, someone could make a pretty cool looking spaceship corridor. 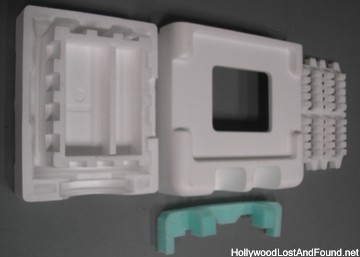 A lot of people don't realize that most of what seems to be various elaborately designed futuristic-looking things on the walls in many science fiction shows is usually, in reality, something being recycled in much the same way. A couple examples that come to mind are from "Star Trek II: The Wrath of Khan" (1982). Inside the turbolift (in non-Trekkie speak, read "elevator"), the fancy pattern behind Kirk (William Shatner) and Saavik (Kirstie Alley) is really just carpet padding. And if you look carefully behind Khan (Ricardo Montalban) on the bridge of the USS Reliant, you can see something that looks suspiciously like what were once holders for old audio cassettes. I recently heard someone in the media accusing the entertainment industry of being one of the least environmentally friendly groups out there. It wouldn't surprise me at all. And I'm not about to say that recycling a couple pieces of plastic or Styrofoam is going to save the world, but all of us should start thinking of creative ways we can recycle. Whether we're building a spaceship or not.